Individuals don’t win games. Teams do. So how do you improve your team to win? Teams must be challenged together. Teams must learn to communicate. Teams must get over the past mistakes and issues and look to the future. These are the factors that create trust.. with the result being a tight machine-like-unit who work together towards goals and don’t give up. In baseball, coaches can’t control the players in the field or control the talent… what great coaches do is BUILD TRUST. That’s how you win. What can Impact Coaches do for you? For the past 10 years, our coaches have taken pride in challenging athletes to achieve for their teammates. The same dig-deep challenges, out-of-the-box team building activities, and passion infused lessons that we teach to athletes can be taught to your team to get team-like results. As lifelong players and coaches, we’ve been there. From clutch walk off home runs in front of thousands of fans to closing a one run lead with the bases load, we know what stressful situations look like and how important building teamwork is. Our coaches will come to your office to motivate your team through two hours worth of team building challenges, all with relentless energy. If your team is looking to hit longterm goals this quarter, there’s no better investment than getting outside the norm and using sports for what they were intended to do: Build strong teams that last. To schedule email us an info@impactsportsbaltimore.com﻿. We guarantee positive results at all of our events or money back. Sales Events, Trade Shows and Presentations: We’ve found that to be successful coach, you must be assertive, engaging, and inspirational... all traits learned from years on the ball field. Our professional coaches own these traits and know how to command attention in any room. For companies looking to bring attention to their brand, you won’t find a group that brings a better face to challenge your customers to be their best with your product. We partner with companies to do live demos, get attention at trade shows, and do live presentations all to get eyes and minds on your offerings, all planned for you. If you haven’t seen any of our coaches in action, schedule us for a meeting to understand the presence we can bring to your event. Coach Dave played collegiate baseball at Shepard University and was a college coach at Frostburg State. Dave is described by teammates as “a true leader: the type of teammate that everyone turns to at crunch time”. Dave has one true inspirational mission in life: to dig out the passions of individuals so that they can give 100% in everything they do because THEY want it. Coach Greg played collegiate ball at Frostburg State University and played 10 years of professional baseball, making it to double A. His biggest moment was being called up to AA to close a game in the bottom of the 9th, which he owned. Coach Greg is a professional in every sense of the word, showing others what a TRUE game face looks like, and how to bear down and get results, no matter what. Coach Brett played ball at Wake Forest University and earned an MA in Psych and Counseling at Johns Hopkins University. 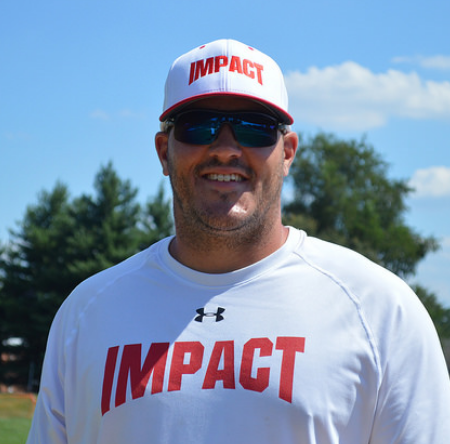 Brett started Impact Baseball 10 years ago, using his networking skills to grow Impact’s customer base zero to thousands in a few short years. Brett is an expert and conflict resolution by digging to the core of relationship issues so that teams can forget the past and move toward the goal.